A series of curated talks will examine how we can design systems, tools, and technologies that allow for the uniqueness of our varying communities to co-exist and nurture people to produce better outcomes. Bresslergroup User Researcher and Ladies That UX (LTUX) Philadelphia co-founder, Alex Visconti, will present on Including Women in Design with her LTUX co-founder Sara Hall, Product Manager for the City of Philadelphia. The increase of women in the tech and design fields has influenced how products are created, sold, and maintained, often for the better, but has it changed enough? Visconti and Hall will present a collection of products (both digital and physical) curated by their LTUX group to anchor a discussion about UX “for women” successes and failures. On the agenda are three other speakers who will discuss inclusive UX design to improve the usability of government websites; the importance of focusing on edge cases; and the progress of the Smart Room Concierge pilot undergone by Jefferson Health’s Digital Innovation & Consumer Experience (DICE) group. 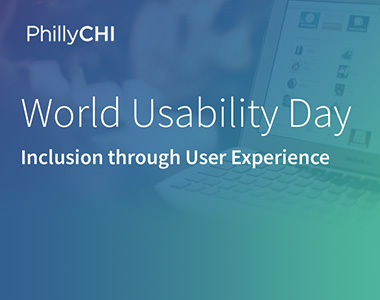 Please join us to celebrate World Usability Day 2017 in Philadelphia! Food and drinks will be provided. World Usability Day is single day of events occurring around the world that brings together communities of professional, industrial, educational, citizen, and government groups for our common objective: to ensure that the services and products important to life are easier to access and simpler to use. It is about celebration and education — celebrating the strides we have made in creating usable products and educating the masses about how usability impacts our daily lives. It is about making our world work better. It is about reaching out to the common citizen and spreading the message: We don’t have to put up with products and services that don’t work well and that human error is a misnomer.